Having an enclosed space for your dog to play that is safe and secure is a great concern for most pet owners. 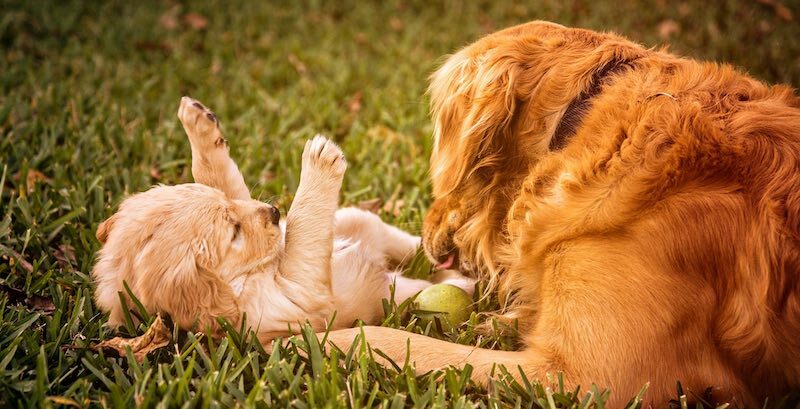 By nature, dogs are playful and inquisitive animals that tend to wander around without worrying about the risks involved. The thought of something bad happening to your playful dog is not something you might want to contemplate or experience. As such, it is crucial to find a way to keep your dog safe in your homestead while leaving it with enough space to play. If an enclosed fence or wall is not present to keep your dog confined in your compound or you would want your dog to stay within a particular area, a wireless dog fence is a great option for you. These are invisible fences that are great at keeping your dog contained within a defined boundary. There is no need to erect a physical fence or barrier when using the electrical fences. The electric dog fences feature different designs in order to suit different preferences of the customers and to feature the latest technology. As a result, selecting a dog fence that suits your needs could become a difficult task. To make picking a invisible dog fence easy for you, we have collected and reviewed the best wireless dog fences that you find on the market today. What is the Best Wireless Dog Fence to Buy in 2019? With PetSafe Wireless Pet Containment Systems, you can be sure to secure your over 8 pounds dog comfortably within your desired boundary area. Once plugged in, the transmitter is capable of emitting a constant radio signal up to 90 feet, a range that is adjustable in all direction. With a set-up time of as little as 1-2 hours, this portable containment system comes handy in vacation homes as well as RV camping. The unlimited number of pets that can be added to this system also makes it ideal for people owning many dogs. The system is ideal for dogs 6 months or older and weighs above 8 pounds. Moreover, the collar size is adjustable from 6 to 28 inches, is lightweight, and waterproof. It uses non-rechargeable RFA-67 batteries that last up to 3 months but can be easily replaced. It also features a 5 level correction time and a tone-only mode. The containment system provides quality performance, added safety, and comfort for your dog. 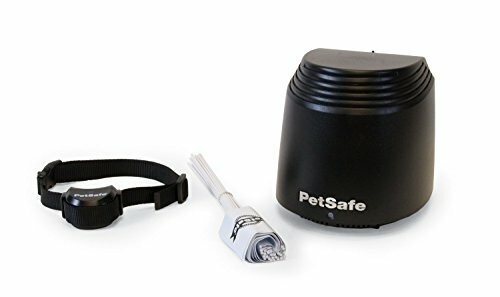 It is packaged with a wireless transmitter, 50 boundary-training flags, an adapter, a test light tool, a collar, a battery, long contact points for haired dogs, and a guide for operation. The Stay + Play wireless fence forms a circular boundary to contain your pet from 22 to 210 feet in all directions. This means that you can adjust the boundary to the desired radius with a turn of the dial. The collar is also waterproof and ergonomically designed. It also comes with an inbuilt rechargeable battery that charges in 3 hours at most. The collar fits most dogs with neck size ranging from 6 to 23 inches. It is perfect for a dog weighing 5 pounds and older than 5 months. This means it can fit even small dogs. It features a five adjustable static correction levels with a tone-only mode. It is equipped with an automatic shut-off option that auto stops corrections after 15 seconds. 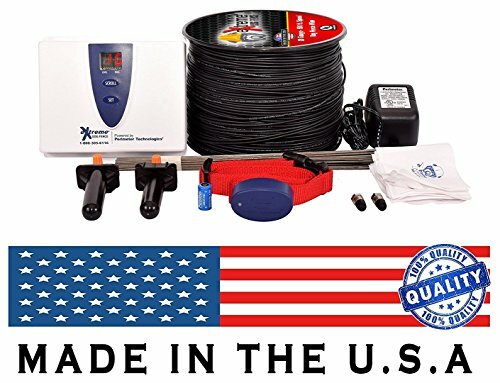 This invisible dog fence kit comes with a transmitter system, a receiver with an adjustable collar, a 150m perimeter wire, 50 boundary-training flags, and a user guide. The expandable range and the ability to be used by an unlimited number of dogs make Stay + Play Wireless Fence one of the best in the market. 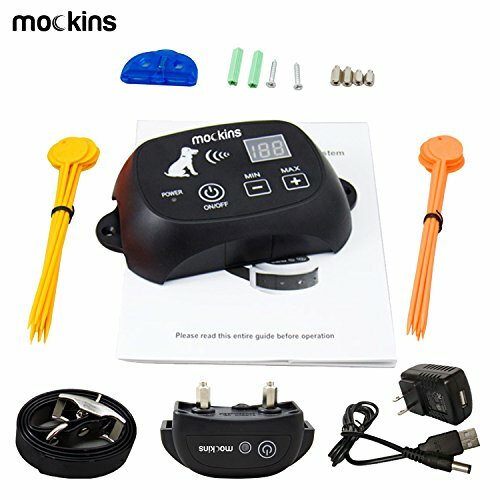 With Mockins Wireless Electric Pet Fence, you do not have to dig around your homestead to bury wires. You will be sure that your dogs are secure and safe within the desired containment without the extra hassle. In addition to a Limited Lifetime Warranty, this wireless kit also comes with a wireless transmitter, a receiving collar, a charger, an LED test light, an adjustable TPU strap, boundary flags, metal contact probes, and a user manual. This in ground wireless fence system provides a coverage diameter of up to 1600 feet, allowing plenty of room for your dog to run and exercise freely. Moreover, the transmitter signal strength is adjustable with regard to whether you have distracting obstacles like trees and walls or you are out in the open. The fence is easy and simple to set up. You simply pair the collars to the transmitter, erect the boundary flags at the desired place, and you are set to start some go fetch play. The transmitter features a rechargeable battery while the collar is waterproof and a perfect fit for all types of dogs. The second Generation Extreme Dog Fence is an upgraded premiere static correction dog containment system that provides up to 25 acres of coverage. The transmitter features an adjustable radio signal that allows you to set the desired coverage area without interfering with any of your neighbor's wireless dog fences. The kit comes with a digital transmitter, a waterproof collar, a boundary wire, 50 training flags, a battery for the collar receiver, and a set of comfort contact covers. While most electric dog fences correction zones might shift in cold temperatures, the Extreme Dog Fence features a transmitter with inbuilt electronics that compensate such limitations, maintaining the original boundary range. This 100 percent wireless fence system for two dogs comes with a cordless circular shaped boundary with adjustable 10 to 100 correction levels and a radius of 40 to 500 feet, which is equivalent to 18 acres. This invisible fence can support various sizes of dogs ranging from 10 to 110lbs at once. 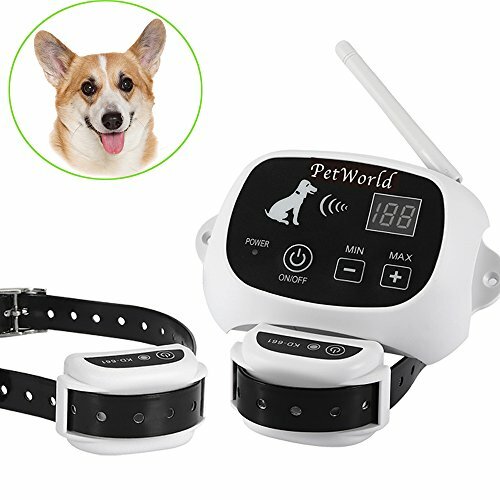 It features a waterproof receiver collar with rechargeable and automatic sleep function. This allows your dogs to exercise freely within the containment, even when it is raining. It is also easy to set up and pair. You simply plug in the transmitter, pair it with the receiver, and set your dog loose. No need to bury wires or dig a fence. 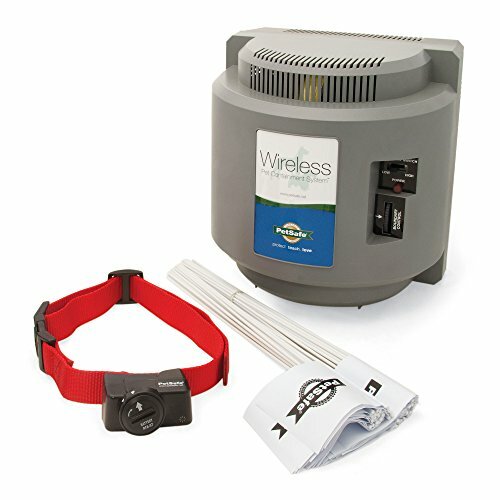 The 100 percent wireless feature makes it the winner in this list of five wireless dog fences. Despite their differences, wireless dog fences seem to work the same, particularly in their degree of efficiency and performance. What do we mean? They serve a similar purpose as well as utilize similar elements. However, the difference emanates in the intensity of the functionalities they provide. Let's have a look at the things you should probably consider before purchasing a in ground dog fence. One thing that you can't afford to keep your eyes from is the area of coverage. Evidently, different models come with different coverage area ranging from a half an acre to 25 acres. As the area of coverage changes, the price of the wireless fence also changes significantly. After all, there is no need to go for fence meant for a larger area when you have a small compound area. Keenly consider the ability of the dog fence to adjust in line with the set boundary sizes that you require. Sometimes, you may want to move with your dog. As such, you should consider choosing a fence that has an expandable limit ability. If you do not intend to use it outside your compound, you don't have to choose a fence like this one. The size of the dog you want to contain matters when it comes to buying the best wireless pet fence. Your small puppies or small breed dog are not best with these fences. Nevertheless, if you have a bigger dog, you may consider selecting one with a custom collar with more and stronger correction frequencies to get their attention. How many dogs do you want to secure? 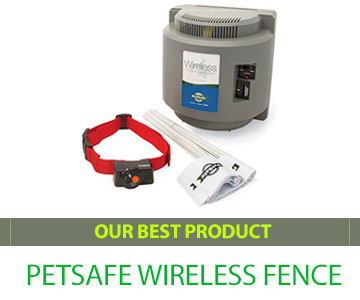 Most wireless dog fence systems are suitable for containing one or two pets at a time. However, other models are limited by the number of collars they come with. If you have one dog and intend to own more in the future, it will be better if you buy a system that accommodates more dogs. Otherwise, if you intend to have one dog, it is important to consider a one-collar receiver dog fence. A wireless pet fence should come with installation user guide and training instructions on how to install and use them safely with your dog. It is crucial that you understand and get to know how to install and use your dog's fence system properly. It should also be easy to install. You will also need to pay attention to cautions issued by the manufacturer regarding the use of their fence. If you realize your dog is suffering too much from its usage, you should terminate its use immediately and seek professional help. Look out for the features below when you are buying a wireless dog fence system. What extras can you buy for the system? For example, can you buy extra batteries, repair collars, transmitters etc.? What training options does the kit have? It could feature one static simulation or all 3 static vibrations with tone training modes. How many pets can the system support? What kind of batteries does the collar receiver operate on? Replaceable or rechargeable? How long do these batteries last or how often do they need replacement? How do the warning and correction levels work in the system? Are they adjustable? How big? 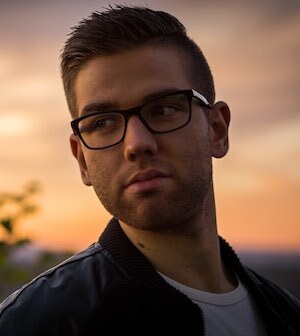 Is there any additional feature? Are there safety features on the system? If you have a dog, sometimes it feels like you are almost raising a kid. This means that you will go to great lengths to ensure it is safe and active. Obviously, you are aware of the dangers that your dog might encounter when wandering in your compound. To ensure your dog's safety while maintaining and encouraging its activity, pick one of the best wireless dog fences listed above to create a secure playground for your dog.